Only nine days after giving birth, Wila Idris left her infant child for the first time and returned to a classroom at the University of Southern Maine’s Lewiston-Auburn College. Since becoming a substitute teacher in Lewiston schools almost a year ago, the Somalia-born mother had talked with immigrant students who needed help but didn’t know how to ask. “The first day, they asked me a lot of questions,” Idris said. They hungered for someone like her, who understood them and looked like them. “We can do much more,” she said. It’s why the class — the Educator Diversity Initiative — was created. The idea came from a summer 2017 class in Portland, hosted by USM and led in partnership with Portland Public Schools. Its aim was to give a diverse group of prospective teachers some insight into how they might become teachers. It seemed like a good idea to Bill Webster, the superintendent of schools in Lewiston. The city, Maine’s second-largest, has a sizable immigrant community. “Our students would benefit by having more teachers and staff who have a similar background with them,” Webster said. He reached out to Paul Caron, an associate professor of Secondary Education at the Lewiston campus, and together they shaped the class. They gathered a group of people — mostly immigrants and mostly substitute teachers — and created a five-week class. They began by issuing ID cards and maine.edu email addresses to the students. They learned about Maine’s requirements for teachers, the level of schooling needed and the related laws. They also learned about how the Lewiston School Department works from several administrators including Webster. He described his annual $84 million budget, how it’s spent and who decides. “I think most of them got the idea that it is a long road, but they are enthusiastic about continuing,” he said. To Idris, it helped deepen her understanding of the schools where she teaches, she said. Working with children is a skill this mom of seven knows — “I am a mom,” she said proudly — but she’s learning about rules and laws and procedure. She’s currently attending Central Maine Community College. Next year, she hopes to enroll at USM, concentrating on early childhood development. Several of her classmates said they planned to become full-time teachers. Bishara Alkher, an immigrant from Chad who substitute teaches in Lewiston, said he hopes to have students of his own. Like Idris, he said he has learned that his background can be an extraordinary asset for immigrant children. 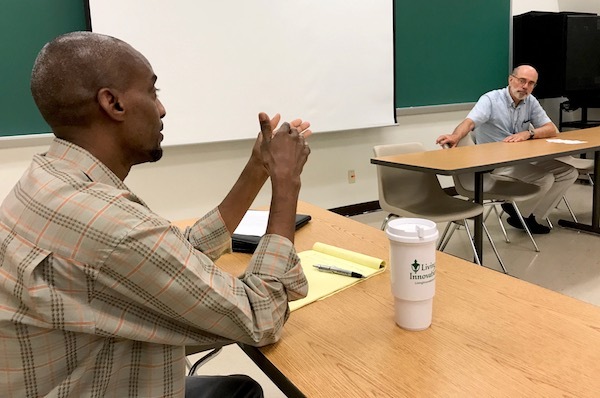 He could serve as a connection, bringing together a local school and the immigrant community. The children and their families and the schools need to be closer, he said. He said he savored being a USM student for the class’s duration.